The last performance at the Rambol beach in Goa. 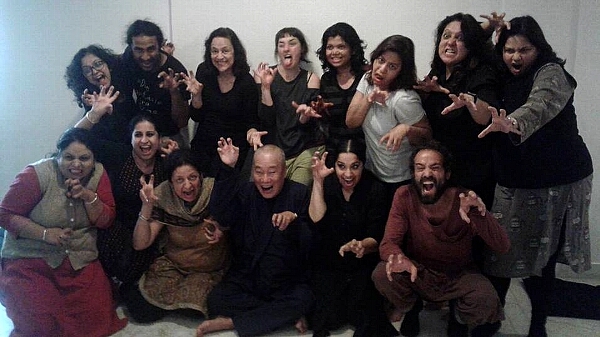 The 3rd India Resonant Butoh Tour is over. See you next year. We plan the 4th India tour during Jan - Feb, 2018, starting from Rajasthan, Kolkata, Tumkur, Bengaluru, and finishing at Goa. If someone will resonate with and organize some activities at your place, we are open. Please inform us frankly. Warm Resonance! Thank you, Bharath Kishore for the slideshow! Videos are being edited by Jordi now. Coming soon! 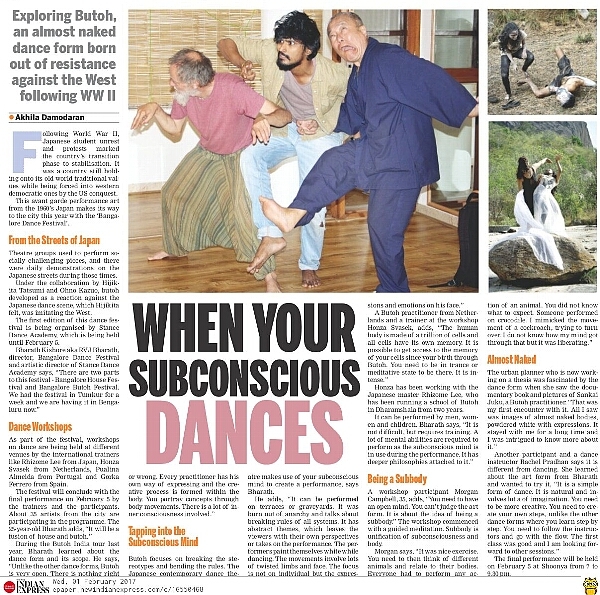 AntzFarm which was the first stage of the Bengaluru Butoh festival, is placed in the deep jungle of South India. In the night leopards and bears would wander and eccentric roar echos. The middle day of a weekly workshop of <Dreaming Share>, the participants danced in the nearby jungle to find a favourite place. 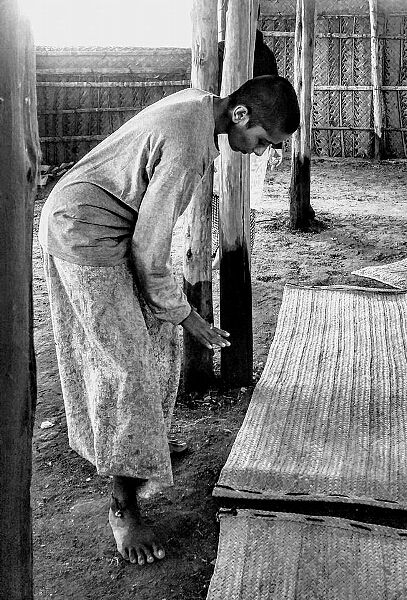 The young man from Afghanistan who danced first with Banyan tree, dancing the scars of the war engraved on his mind and body, moved us deeply. Whether it is a short-term workshop or not, it is a feature of <Dreaming Share> that is able to resonate at the deepest place of each other. 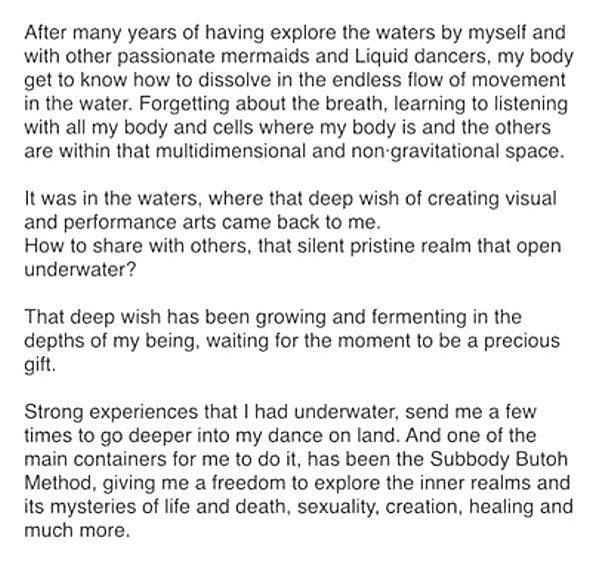 The way to cut into real Butoh of Life Resonance finally opened. 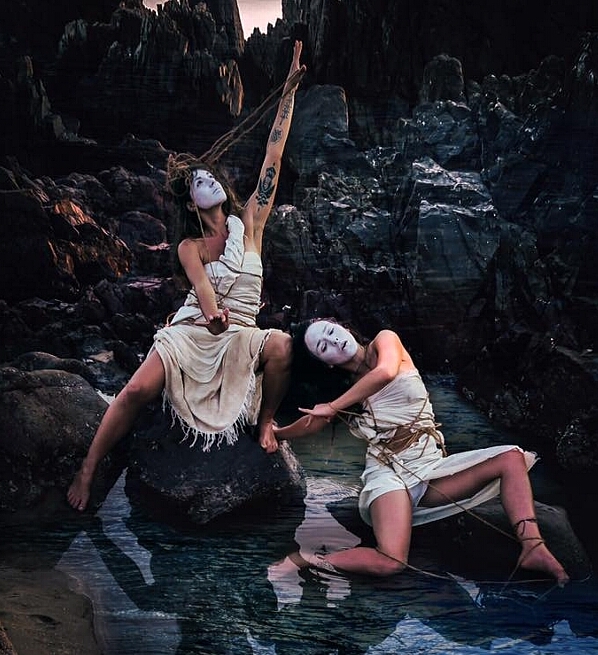 We experimented the ”Lucid dream share" and "Butoh fusion" in the workshop and performance. Both were so rich harvest. Bharath who is the organizer of the festival is a house dancer, and he tried the fusion of butoh and house dance for the past year, so we experimented how to deepen the fusion. Many of the participants were experienced in various genres such as Indian traditional dance, Belly dance, Street dance and so on. We explored the dance of the Life Resonance dimension before the human dance differentiated into various kinds of dance styles. In the workshop, I introduced two important techniques. The first one is " Fine Segmentation", the delicate control technique of Butoh, to segment our face, hand, body into 100 fine parts, and each detail resonates with various Qualia. The second technique is Japanese resonance method of "Awase-Hanare". It is to resonate with the music, sometimes with the same pattern and sometimes with diffrent pattern. So that we can resonate flexiblly with various music and inner subtle Qualia stream. Furthermore, in the performance, each participant created a dance transforming into Butoh from the various dance styles such as Varanaciam, Belly dance and House dance. That work was an interesting process exploring something about the animism before the ancient dance differentiated into the national dance of each country and the dance that comes out from the pure Life Resonance that is the basis. Originally, Butoh started from the Quest for the "Butoh of Life" beyond the differentiation of the dance styles. Tatsumi Hijikata learned the ballet, modern dance and social dance etc. He quested the deeper realm beyond the differentiation of the dance styles. This experiment is the quest for what is the "Dance of Life" before the differentiation into the various dance styles of human. 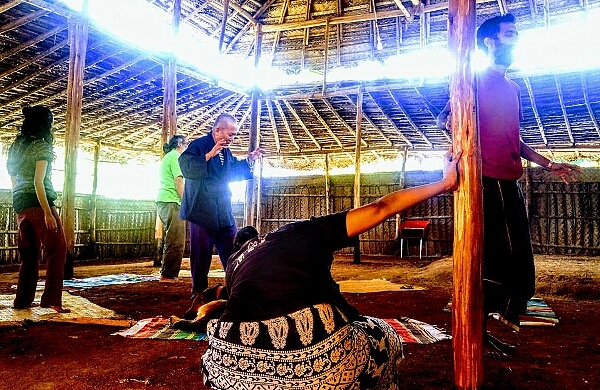 All participants worked ambitiously on the task of exploring the connection with the dance that comes out from the deeper Life Resonance from the dance circulated in modern times that they learned. 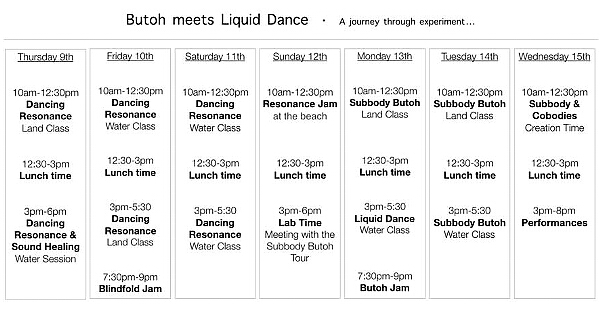 Someday these experiments will be involved into Oneness of "the Butoh of Life" in the future. The Tumkur is so ideal place to open creativity of Life. 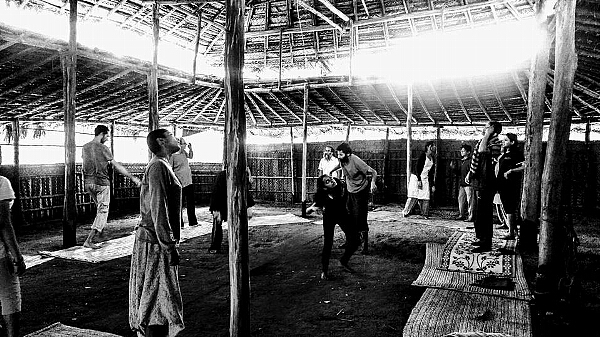 The workshop at the Antz farm in the deep jungle of Tumkur, the first part of the Bengaluru Butoh festival was so unprecedented deep experiments and many discoveries have come out successively. 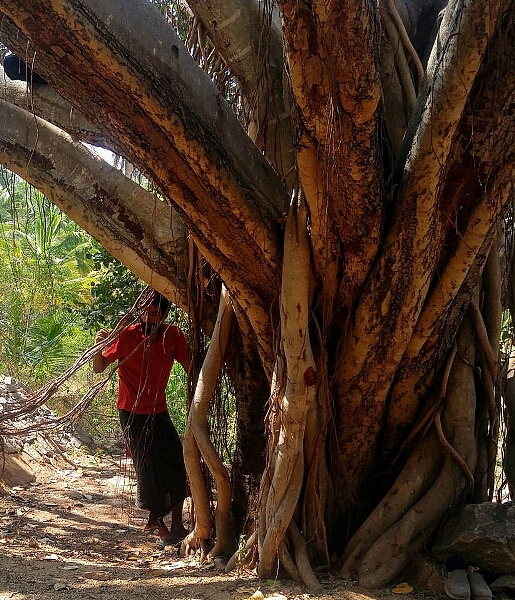 The deep quietness and wildlife of the South Indian jungle evoked the primitive Resonance of Life. It reminds us of the proto Qualia from the sole and skin we have forgotten while we were unaware of the cells memories. In the night we heard mixed with the roar of the trees such as palms, bananas and banyan and unknown animal voices of diverse beasts and birds echoed away. Actually one dog in the farm was eaten by the leopard a part of his face three years ago, and the pain of the wound still dragged. The fear of such an invisible world is the source of the ancestral Qualia that is darkly folded in the darkness body. Three years ago, while studing Hijikata's "Sick Dancing princess", I was struggling how can I guide to the contemporary young people who do not know such deep darkness of the northeast Japan before the war that is the stage of it. I felt that we need to touch that proto scenery. 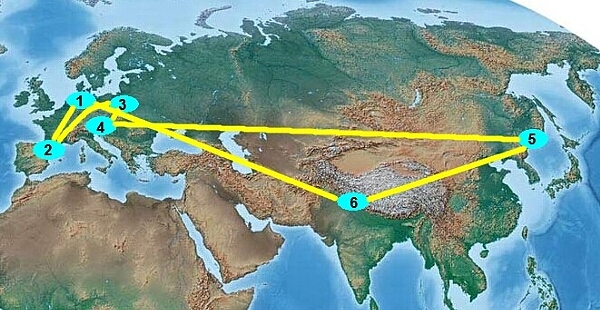 It was the original motive for the Indian tour. The proto secenery has disappeared from the advanced information society of Japan and the West. I searched for it to be sure to remain in the backyard of India. And finally we have reached an ideal place. Not only found the proto scenery, but we goto the method to share the proto world in the each darkness of body. <Chaos share> which we become the self-hypnosis mode, and open the full imagination, and co-create wach world, is continuing the experiment in the India tour goes through Kolkata. 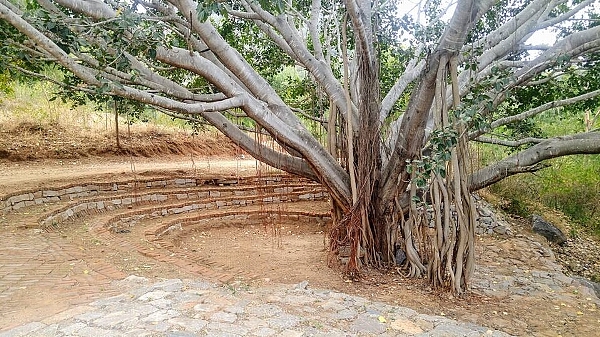 And it was connected with previous subbody method which we share the subbody movement in the silence, and deepened into <Journey Share> in the wild environment of Tumkur. Explaining by word the different journeies of each person discovered in the self hypnosis mode through the conditioning and self researching, and integrated into a <Journey Share> through the co-creative movement of the body. Details on this will be given to another article. So interesting imaginary journeies came up from a collective unconscious region of local Indian people and international tour members. We were able to share an unprecedented and deep experience of co-creating the diverse world with the body movement. Denish of AntzFarm who supports the creation of local young people also welcomed this experiment with pleasure. Next year I promised to do a longer workshop. 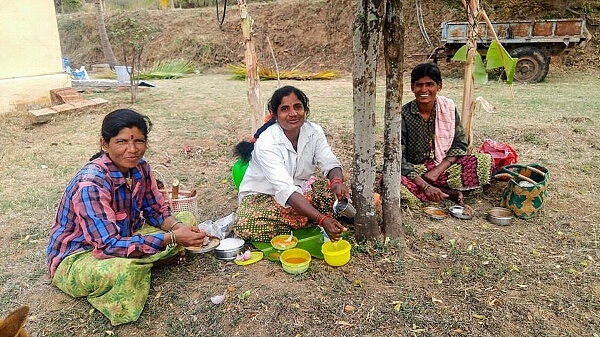 Dharamsala in North India and AntzFarm in South India, one more subbody base in India has increased. The plan to carry out the third world Subbody Gathering in the year after year is progressed, too. we introduce the nature and workshop scenery of AntzFarm. Read the "Sick Dancing Princess"
Schdule of Summer tour 2017 is almost fixed. 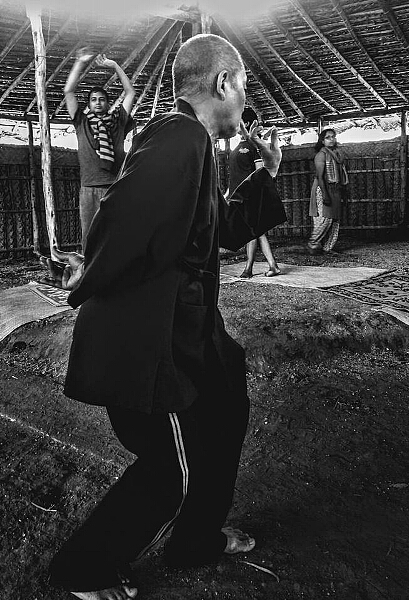 The India Resonant Butoh Tour returns for its third edition and stops by the AntZFarm (iruWAY) for a second time, after healing Dharamshala, Kerala and Kolkata for the Bengalutu Butoh Festival. The Tumkur leg of the tour will begin with a week long residency and exchange with practitioners, tour participants from all over the country and the world, local residents and enthusiasts like YOU; and it will end with a showing of the week long exchange. 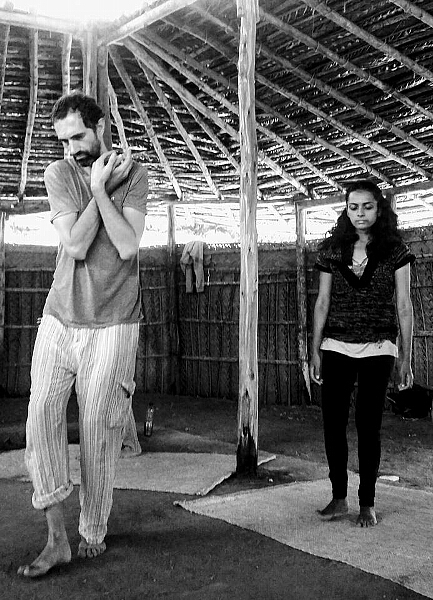 The tour will then move to Bangalore for a week filled with workshops, performances and exchanges. 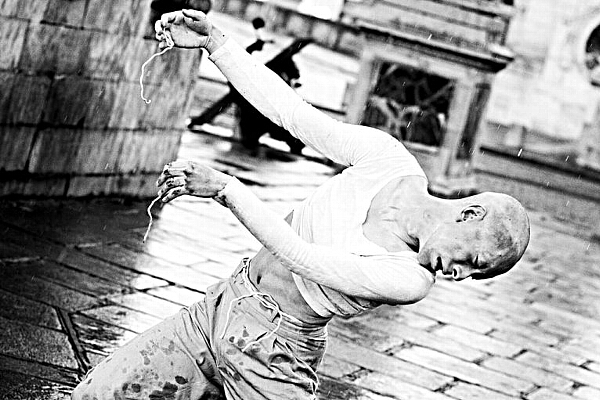 Master Rhizome Lee- a practitioner of Butoh for the last 30 years will be guiding the tour. Rhizome Lee, born 1948 in Japan , was a student of Akiko Motofuji, wife of Tatsumi Hijikata, who is considered as the Originator of Butoh. 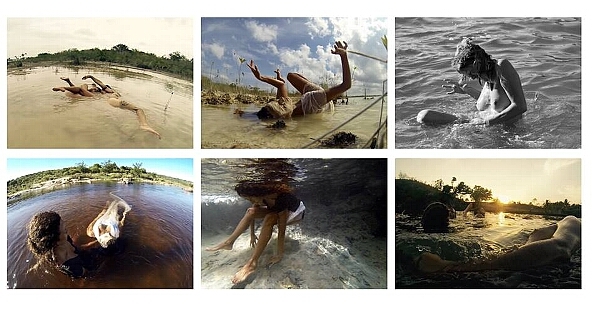 Rhizome Lee has performed and held workshops at over 20 countries in the world, (1997-2004). He is the proponent of the Subbody Resonance Butoh Method・and started the 全ubbody Resonance Butoh School Himalaya・at Dharamsala, H.P., India, in 2005. He has guided international students as a midwife (Facilitator) to foster & fuel creativity of Life. 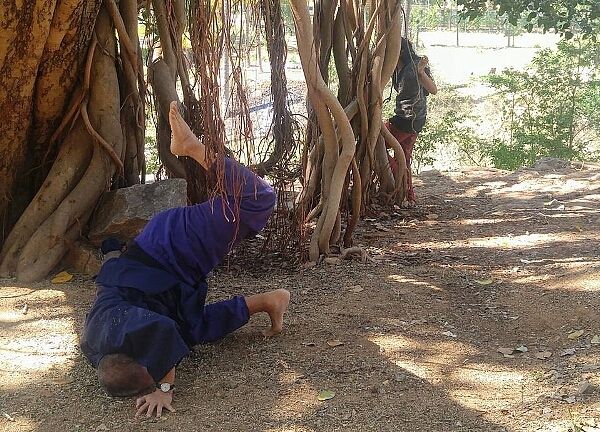 He has trained over 1000 students. Over 20 of graduated students have opened their own practice places at various countries. Subbody is another body which lives in the darkness of the body. In this realm subconscious and body become one. It is a creative and communicative dancing body. 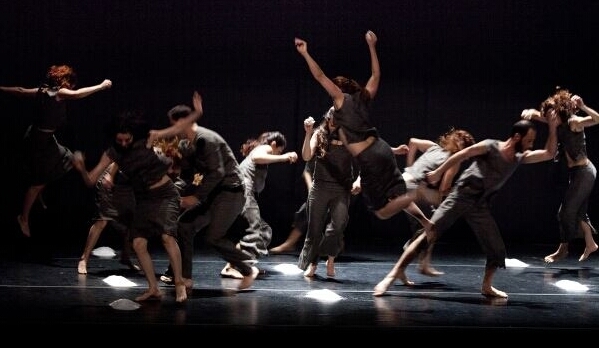 Subbody is an excellent creator of your dream, fantasy, imagination and dance. If you find your subbody, you can become an originator of your own unique and true dance which connects to the deepest of your whole self. We have a safe method to guide you into the darkness of body where subbody lives and to return back controlling yourself. 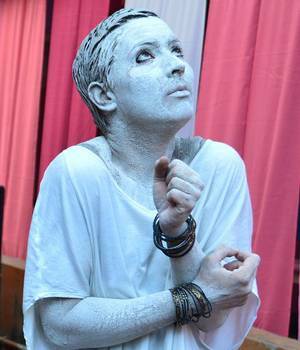 The chaos share workshop at the Creative Arts studio, which was the start of the 2nd Kolkata Butoh festival, gave far greater results than expected. Everyone turned to the subconscious mode, fully opened their imagination, and co-creating their imagination world with the group. This success lightly shines the future of the Indian tour experiment. I regret that it was not able to take a video by technical trouble. I think it can be imagined from the following voices full of excitement of the participants. India tour is developping in Rhizoming ways, Surprisingly Laura who met a hard edge and had to stop dancing for a while, performed in Kerala. So, Rhizome can open the way by oneself, and connect freely, separate flexiblly. Congratulation for your dancing spirit recovery! 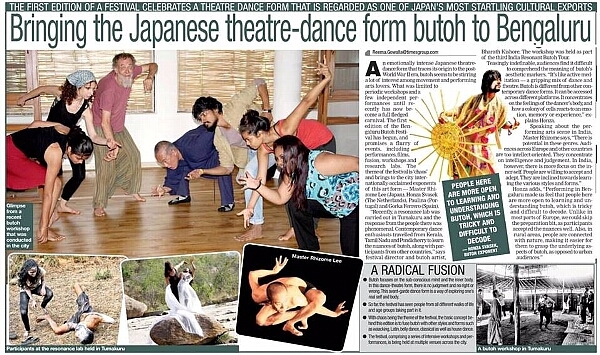 Ms. Dyduch, who learned the dance under the tutelage of Butoh maestro Rhizome Lee at Subbody Butoh Himalaya in Dharmasala, Himachal Pradesh, is in Kerala now on a two-month tour to promote the dance form. She will be performing at the Kochi-Muziris Biennale. A sociologist serving children with special needs, she got trained in Butoh because of a passion for it. She said that Butoh was a dance form that took roots in the post-War Japan. “This art form conspicuously rejects traditional styles of both eastern and western dances. Butoh expresses intense emotions through slow, controlled, and even distorted movements,” she said. It is traditionally performed in white body make-up. Butoh was created in 1959 and the founders are Hijikata Tatsumi and Ohno Kazuo. “The world’s dance started from standing, but mine started from not being able to stand,” goes a famous quote about Butoh by Tatsumi. The dance form emerged in Japan “during a time of social change post World War-II when the Japanese society was in confusion caused by industrialisation vis-a-vis their traditional culture; horror caused by the bombs over Hiroshima and Nagasaki; and urbanisation and political disenchantment against the Japan-U.S. security treaty. Ironically, Butoh was rejected in Japan during its initial days, but found wide acceptance in Europe during the 1970s, said Ms. Dyduch. It began attracting wide acceptance in Japan only during the 1980s. Nowadays, Butoh is preformed all over the world and mentioned in almost every contemporary dance history record, she said. in the 1st India tour. (We did not know even how to greet them, it has finished only coming across. How can we meet deeper than that? All Qualia that are shared by all human beings are the Life heritage that Life has preserved in the cell through the Life history of 4 billion years. There is a wisdom of Life to resonate well with everything on the earth. Proto Qualia such as fear, shivering, dizzy, blockage and so on,. as an organism. 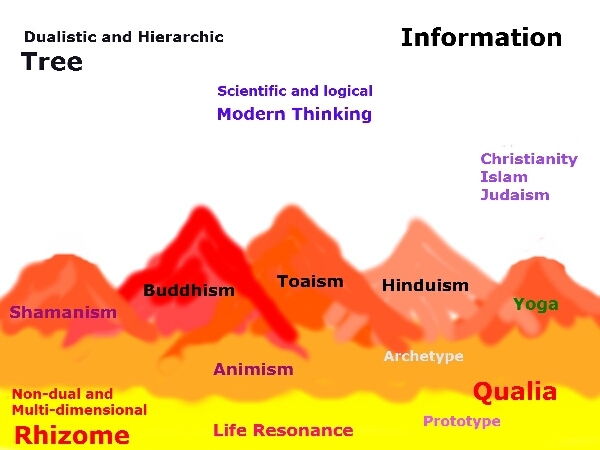 Archetype Qualia such as heaven, hell, god, evil, spirit, ghost, monster, grandmother, trickstar, wiseman and so on. All of them are preseaved during the long Stone era, with encountering the Climate change, diseaster, war, hard immigration out of Africa, and so on. All of human beings share the same Qualia heritage in the darkness of body, especially in the collective unconscious realm. We could find the novel method to the co-creation beyond the borders. Everyone turning into the subconscious mode, opening full of imagination freely, and co-create various worlds through dancing. It is called Inter-Qualia method. In the 3rd India tour, we will experiment it with local Indian people at various places and international participants of the tour together. In the 1st and 2nd tour, it was still a superficial resonance. I could not stop deep chagrin to me. There should be a way for us as a dancer that only we can resonate with. Even though we do not understand words, we share the same Prototype, and Archetype Qualia as the Life heritage. 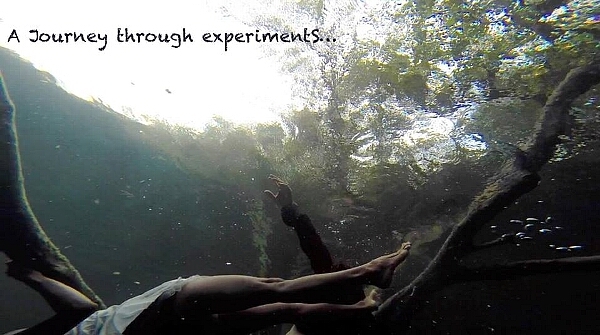 We will experiment for the co-creation beyond the borders. This requires an excellent interpreter to understand both local languages ​​and subbody method. Such an attempt would be the first in human history. Looking forward to what surprising experience! Sudipta and Naireet are preparing now. This years activity will be to share the subconscious cobody through new self-hypnosis method.We do not start from Established performance that separate dancers and audience. There are no borders among us. We do everything together with sharing collective subconscious world and share the new method of nonchalance co-creation.together. ＊Through the experience workshop on 1st day, Lee will explain and guide it with body experience. * If possible, one day at somewhere in the outside.Quiet nature, Riverside, Forest or park. * Collaborative performances are completely free creation Festival by all participants as one Life. Someone can perform seriously, someone dance crazyly or cheerfully, someone perform disabled body and so on including various cobody. *Any participants can add unique program freely, it is our flexible co-creation in rhizoming way! We will BREAK AND EXPAND the established boundary of butoh creation, it is real Butoh of Life. Our daily modern thinking is bound by dualistic and hierarchic Tree system. It is common illusion that is floating in the space separated from the Earth of Life Resonance. In the Life, there are no dualism and no hierarchy. It is completely modern human illusion. We need to stop daily thinking, and to be released from the bind of information of modern world. we take off the blue and black things (see above illustration) of modern human and become pure Life. Participants are required to do it at every moment, otherwise you disturb the pure Life Resonance in the tour. We sink down into the Underground of our mind and body. 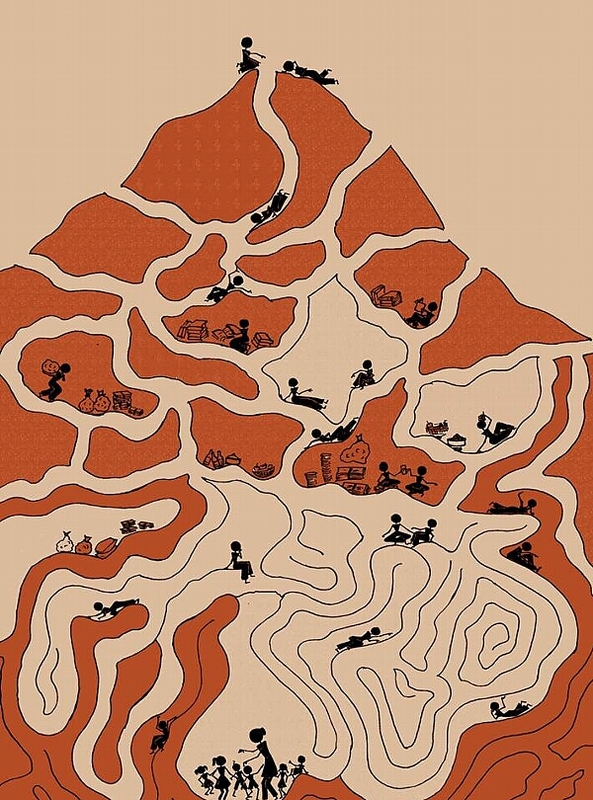 In India and Eurasia, there are some religious mountains; Buddhism, Taoism, Hinduism, and local Shamanism, and hill of spiritual=somatic Yoga and so on. They are based on the Aminism that is the oldest mind=body resonance pattern of Human. Ancient monk people build each mountains of the religious method. they are based on the non-dual Life Resonance, but some of them are bound by dualistic and hierarchic illusion. In the deepest realm, there is the pure Life Resonance world. We sink down into the realm of Life Resonance under the spiritual mountains and hills. It is non-dual and multi-dimensional realm. there is not any judgment and dualistic boundaries. There is no distinction of right and wrong, good and bad, self and others, and so on. It is Rhizome completely opposite to the Tree. We enter the subconscious mode together and share every phenomena in the darkness of body together as One Life. It will be amazing experience for all of us in the whole Life. 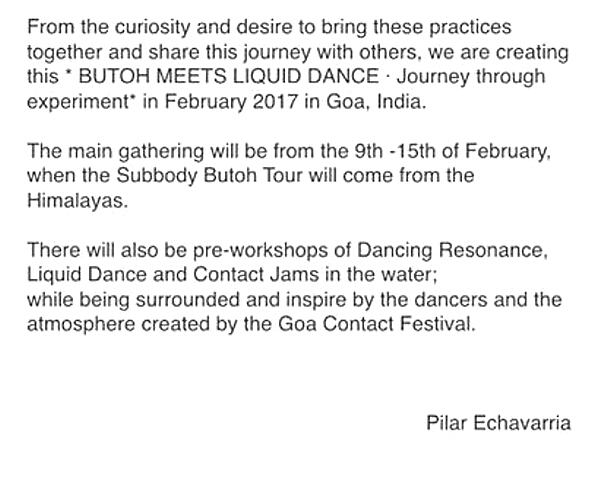 In the 1st and 2nd tour, we danced only each one's subconscious body with resonating with various landscape and local people in India. In the 3rd tour, we will experiment a new method, "Chaos Sharing". It is that all participants including local Indian people enter the subconscious mode, trip freely and share all of them together by cobody movement. 1. Tell yourself "I'm relaxing, I'm relaxing, one, two three" with own mother tongue silently, and we enter the subconscious mode. 2. Choose a part of body that you care about specially, and focus on the part. The part will guide you to a specific imaginary world, just follow it. Travel the world of the darkness of body with opening free imagination. 3. After 10 or 15 minutes travel, we share each one's travel with bodily resonance. There are many ways to share it. Someone can tell the story of the travell by word at first, and co-create the world with with bodily resonance next. Or you can share it by bodily resonance without word. Or you can use both of word and movement at the same time. 4. Anyway, we share each participant's imaginary world together as own experience, and co-create all of them by subbody=cobody movement. It was so diverse and full of strange development that we cannot create by consciousness at all. But, when we enter the deep subconscious body mode, the border between self and others disappers. Even it is full of wiered archetypes and prototypes, we can enjoy it with joy and fun, because it is so intersting and amazing experience. Our subconscious Life enjoy it deeply. The consciousness cannot stop it, because it is so exciting and intersting from the bottom of subconscious Life. This is the novel method to open full creativity of Life and subconscious beyond the baundary of self and others, religion, nationality, sexuality and so on, that was found finally at the third trial of India tour. This is the first atempt in the Human history of the world. It must be unforgetable trip for your Life forever. Wow! I can not stop the spontaneous excitement from the bottom of body. The half performances have done of the 13th festival. I felt something different till the previous festival. It was able to expect the next development till that time, but, in this festival I was always surprised at and able to enjoy the unexpected interesting development of each piece. They could stop creation by thinking, they are really listening to the real darkness of body. It is real non-dual and multi-dimensional Resonance of Qualia. I could confirm that they could really contact with it, and follw the Life Resonance Qualia itself. In this semester, we have continued to share the strange development of each one's darkness of body beyond the border of self and others from the begining. Then we could be familiar with the "Jumping wild without any logic" and able to accept any strange development even of others. Slowly we are growing to the being that is unable to name beyond the borders of self and others. The border is one of the strongest disturbance of this modern world. It took twelve years in the Subbody Butoh Himalaya to reach this horizon. From now, it must become interesting. In the 3rd India tour, also we share it with local Indian people. 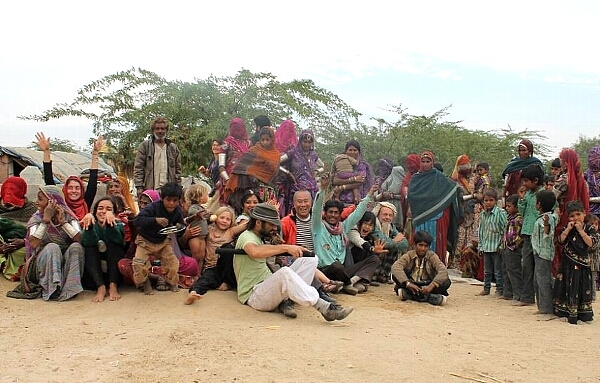 We will dance the local Indian people's darkness of body together. We can share any wiered development of darkness of body even full of strange archetype and prototype. We got the method finally at the 3rd trial. It must be much more interesting and exciting!